Hello, and welcome to Shadow River Boxers! 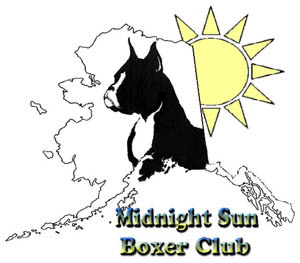 We are a small boxer family, located in the beautiful state of Alaska. My love for boxers began as a child. My family raised boxers at that time, and it was those years that I fell in love forever with the breed. Never had I met a breed with such personality and was such fun! Never more than kids themselves, boxers are the best playmate a child could have! I'll never forget the day my parents first bred one of our girls to a local champion male. Going to this breeder's home was such a special treat, never had I seen such proud, beautiful boxers! Within the breeder's home was a room which exhibited the success that they'd had with their dogs; trophies lined the shelves, ribbons and win pictures covered the walls. It was this visit that stayed with me and gave me the inspiration to follow that dream and one day show a boxer of my own. The summers that followed were filled with "practicing" on our ever patient pets in the backyard. Sadly, my father's job transferred us a great distance away and as a result we had to find new homes for our boxers. It was a very difficult thing to do as they were such a huge part of our family. Ch. Butler's After Math CGC, TDI ~ "Billy"
Ch. Pineridge's Paint Me A Rainbow ~ "Lilly"
Ch. Rodeo's Denim 'N Diamonds - "Shelby"
Chances Contessa of Fortune CGC ~ "Tessa"
I did not get another boxer for many years after that, and when I did, it was like finding an old friend. As time went by, my children spent their childhood years with a boxer as their family pet, just as I had done years before. I never forgot my childhood dream of showing boxers and the day finally came when I bought my first show prospect. Fun times ensued and I have made many great friends and have many a great time in the ring bringing my dream to fruition. 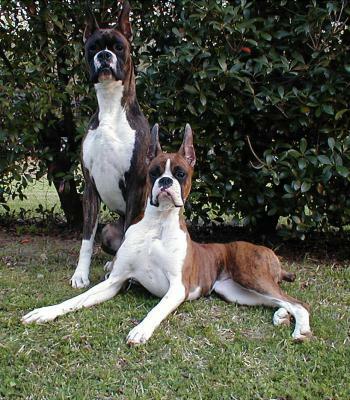 I pay tribute to the lovely boxers pictured above, Cooper and Sizzle. They were my first show prospects and started me on the road to what would become Shadow River Boxers. While we persue different activities with our boxers, they always are and will always be, our beloved pets first and foremost. Shadow River's Rockin Wicked RN ~ "Sydney"